Beautyqueenuk | A UK Beauty and Lifestyle Blog: What's inside the Glossybox Advent Calendar? Full Review with Spoilers! What's inside the Glossybox Advent Calendar? Full Review with Spoilers! I love Beauty Advent Calendars as much as I love Beauty Boxes and that is a lot! Each year little snippets sneak out earlier and earlier and this year, I started writing my post (here) back in July. 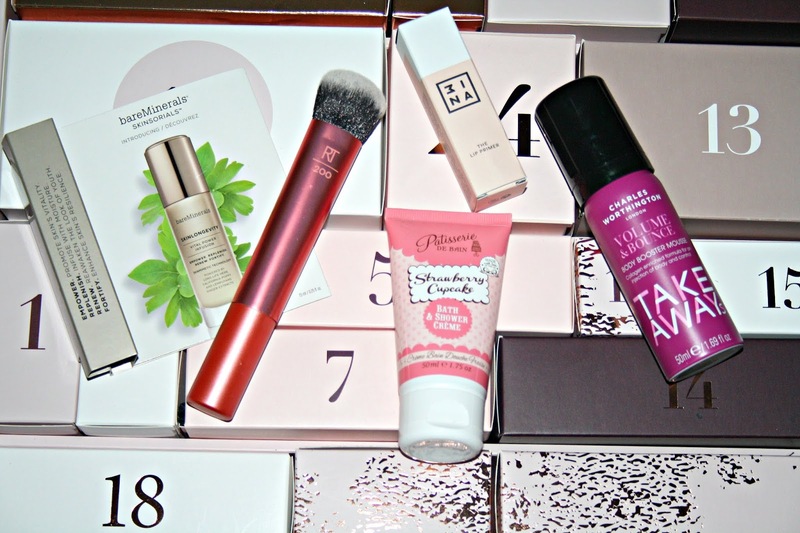 One of the biggest surprises was that Glossybox were to release their very own Advent Calendar and this is what I am reviewing on my blog today. Spoiler alert! If you don’t want to know what products are inside the 2018 Glossybox Advent Calendar then look away now! There is always a discussion as to when the right date is to open your Advent Calendar with different people using different factors to determine those 12 days of Christmas. 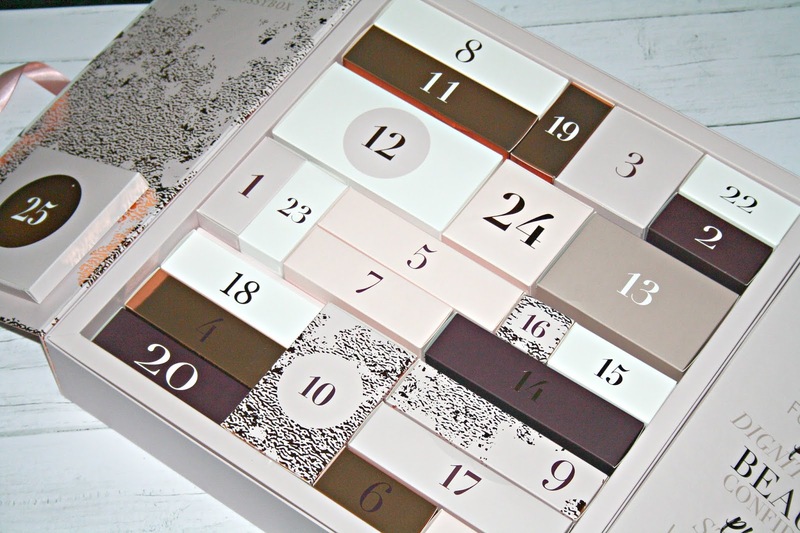 With this Advent Calendar from Glossybox, there are 25 doors to open, so you have a brand new treat for every day of December, including Christmas Day itself. 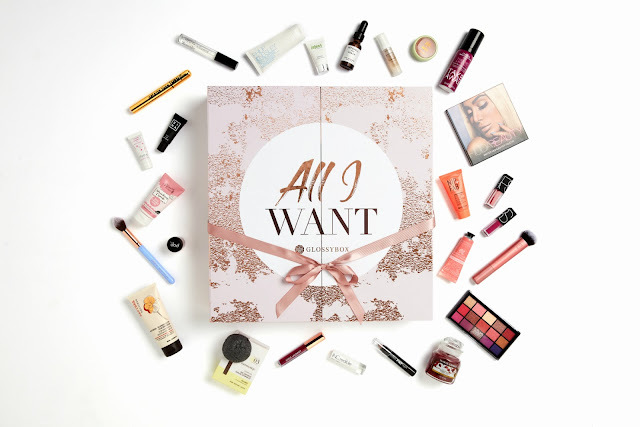 Featuring makeup, skincare, haircare and beauty tools, this Beauty Calendar boasts 17 full-size products, is worth over £300 and as packaging goes, it looks just absolutely stunning with its pink and rose gold colour theme, it weighs an absolute tonne and titled "All I want" here is what you will find inside. Day One - Nars Burning Love. Described as being a cool red with a cream finish, this velvet Lip Glide is an incredible colour for the festive season. There will be two shades available but only one per Calendar. Day Two - Nip & Fab Dragons Blood Plumping Serum - Described as being a A lightweight serum that delivers an instant shot of moisture to dehydrated skin. It uses both Hyaluronic acid and delicate velvet flower to leave the skin looking plumper with the appearance of fine lines and wrinkles reduced. Day 3 - Yankee Candle Season Of Peace. It has been some time since I have burnt a Yankee Candle and this one is a lovely scent that is perfect for the colder months, quite warming but relaxing. There will be three different scents but one per Calendar. Day 4 - Philip Kingsley Body Builder Conditioner. I usually expect to see the Cult product that is Elasticizer popping up everywhere right now but it makes a nice change to try something new. it is said that this Conditioner will keep your hair moisturised without causing build-up. It will add body and fullness to your hair. Day 5 - MDMFlow Greater Than Mascara. Described as being the most intense, highly pigmented XXL black, volumising mascara which has an indented brush for increased volume and clump-free application. I am sure you will agree that this is a great start to the opening of the first five doors! Day 6 to Day 10 - Again, Glossybox has managed to conceal the products really well inside different shaped boxes so you still have no idea what is behind each number. Behind doors 6 to 10 we have a real variety of products, some that I have tried, more that I haven't and one I am really looking forward to trying. Day 6 - 3ina Lip Primer - I adore 3ina as a brand and I love popping into their Covent Garden store to see what is new. This Lip Primer is a product that you can use on its own to condition lips, under a lip color for a smoother finish, or over the top of lipstick for a mattifying effect. Day 8 - Real Techniques Expert Face Brush - A brush I am sure needs no introduction! Day 9 - Charles Worthington Volume and Bounce Body Booster Mousse 50ml - Designed to give vital body, bounce, and control to lifeless hair. The formulation contains style memory technology to keep hair full of volume all day long. Day 10 - BareMinerals Skinlongevity Vital Power Infusion 7.5ml - Described as being a dynamic, first of its kind infusion is designed to revive and help maintain your skin’s most vibrant look of health, and reduce the appearance of fine lines and wrinkles. I really like the sound of this and am looking forward to giving it a try. Again, I think Glossybox have managed to include some really interesting products in the boxes and all ones that I will use. 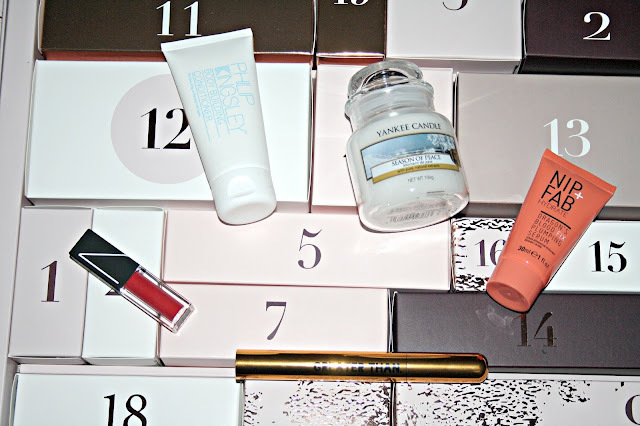 Day 11 to Day 15 - We have now reached the mid-point of this Calendar and have been treated to some lovely products. These doors are again a great mixture of makeup and haircare and whilst I am more familiar with brands such as MUA and Bellapierre, the rest of the products featured here I am not so. Day 13 - Karmameju Charcoal Konjac Sponge - This is a new brand to me but I am a huge fan of Konja sponges in general. Described as being a soft, cleansing and exfoliating Konjac sponge infused with active Bamboo Charcoal to help prevent blemishes and breakouts. Day 14 - Elgon Refibra Haircare Concentrated Restoring Mask - This is another new brand for me and I am a huge fan of hair masks. Described as being a mask which helps to restore any hair damaged by excessive styling or exposure to harsh elements back to its full-bodied, soft, beautiful self. It uses Marine Lichen and a combination of essential minerals and glycerine. Day 15 - INC.redicle Jelly Shot Lip Quencher - Enriched with moisture-boosting and protecting ingredients to help nourish, moisturise and repair your lips. Formulated with a blend of avocado, vitamin E and rice bran oil, the transparent jelly shot comes in fun tints with a super cute hidden flower detail. Again, some more amazing products that I am yet to try and I am intrigued by the hair mask and the Lip quencher as I haven't tried INC.redible either. Day 16 to Day 20 - Not many boxes left to go and still some big names to appear, here are the next few products. Again, the boxes are so well designed that I had no idea what products I would find behind each of these numbers. Day 16 - Pop Beauty Metallic Copper Pigment - I have never come across Pop Beauty as a brand before and this eyeshadow pigment is really quite striking. I have the shade Metallic Copper and it is every bit as stunning as you might expect being an almost burnt burgundy shade. Day 17 - Luxie Beauty Tapered Highlighter Brush - Again, this is another brand I have never come across. Said to have launched in 2014, this brush has fluffy and soft synthetic bristles and is designed to add a shimmering glow to your complexion. 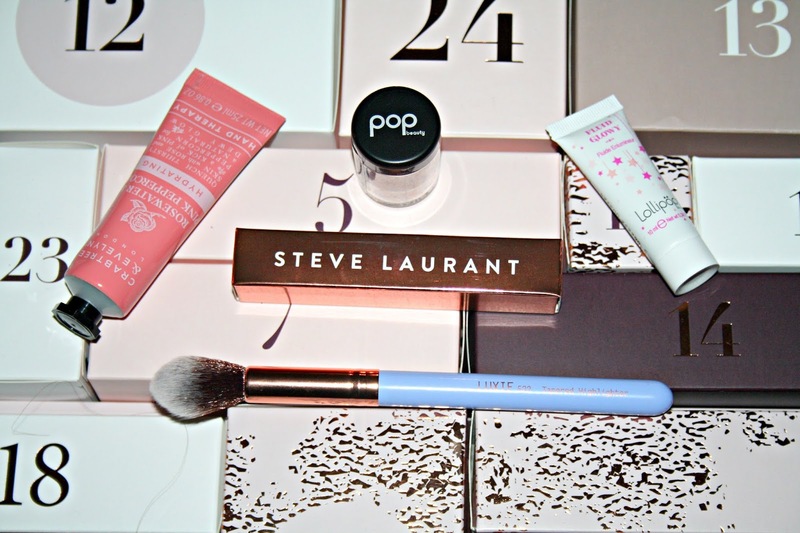 Day 18 - Lollipops face liquid highlighter - Keeping up with the products that I have never come across or used before, Lollipops beauty is quite a shimmery highlighter and as it comes nestled inside a tube. Day 19 - Crabtree & Evelyn Rosewater and Pink Peppercorn Hand Therapy - I am a huge fan of Crabtree & Evelyn hand creams and this is one I am yet to try. Using a blend of Shea Butter and ceramides, the rich formula rapidly absorbs into skin, delivering an instant moisture boost with Hyaluronic Acid whilst forming a soothing, protective barrier. Skin is left feeling softened and rejuvenated, with a lingering, fresh fragrance of Rose Petal, deepened with a hint of spicy Peppercorn and Patchouli. Day 20 - Steve Laurent Lip Ggloss in shade Eggplant - This is another brand I have got to know via Glossybox and to date, there isn't a single product I dislike. Described as being a luxury formula is lightweight and doesn't clump or stick. It is said to be one-part balm and three parts silk, formulated with a creamy, high-tech, lip-softening texture, it is a one of a kind hybrid gel-oil mix that will moisturize and hydrate with just one swipe. Days 21-24 - Now we are coming to the end of this Calendar with just five days left to open and this time I am sharing with you the final four doors before one big reveal. These four doors have been my favourite to open and I cannot wait to give each of the products a try. Day 21 - Pixi Beauty Beach Rose Blush - This blush is just stunningly pretty. A soft rose shade, it is for me a product which sits between a bronzer and blusher, if you like neither product then this is the solution. It uses light-diffusing powder blush is made with vitamin E to keep your skin soft, smooth, and hydrated. Day 22 - Zelens Transformer Mask - Despite so many people raving about this mask, until now I have never tried it. Described as being a refreshing cream mask packed with antioxidants that work to hydrate and energise your complexion. 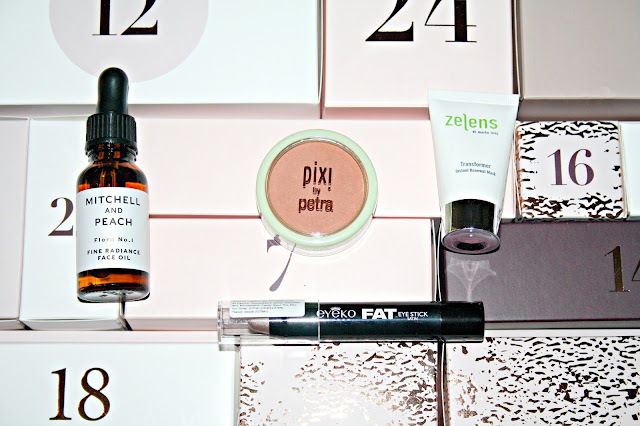 Day 23 - Eyeko Fat Eyestick in shade Satin - This Chubby eyestick is a stunning shimmering Taupe which is really pigmented. Using a twist-up design, the easy-to-control jumbo pencil glides on without dragging or tugging. Day 24 - Mitchell and Peach Flora No.1 Fine radiance facial oil - The penultimate box and what a fantastic oil this is, I couldn't wait to open it and try. Described as being rich in powerful natural antioxidants and vitamins which will be instantly absorbed by the skin leaving it glowing with radiance. Having since discovered there is an entire Mitchell and Peach range I really want to try the candle and the bath oil! 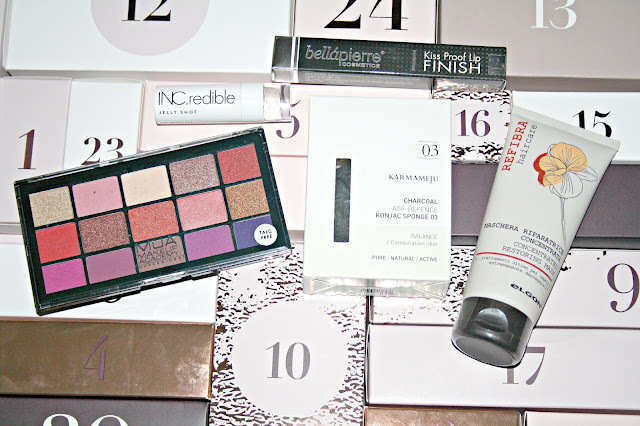 I am really happy with the contents of this Glossybox Advent Calendar, it has such a good mixture of products from a range of brands reaching from the Highstreet to High End brands but there is just one more door to reveal and again,if you do not want to know what is behind door 25, then click away now! 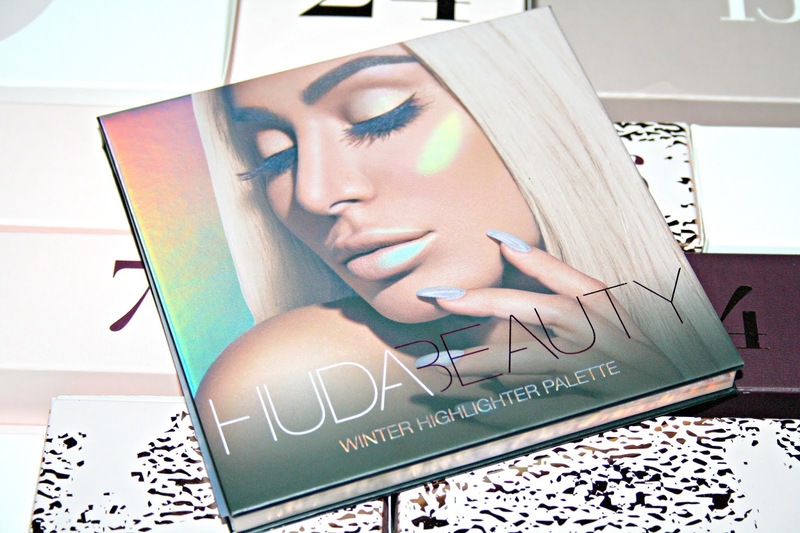 The Huda Beauty Winter Solstice Highlighter Palette! I am sure Huda needs no introduction and I am sure most people reading this will own at least product from her ever-growing range? For me, this is my first ever Huda Palette and I am shocked by how stunning it is. 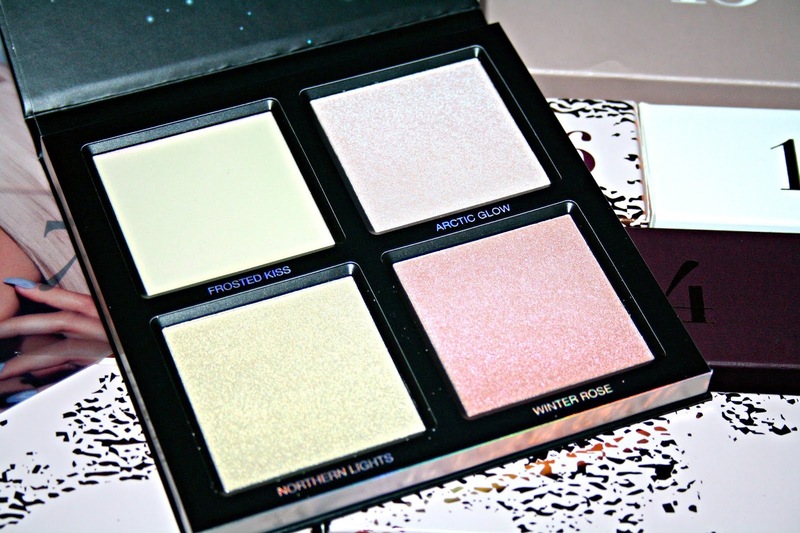 Inspired by the icy complexion of a winter goddess, Huda Beauty’s Winter Solstice Highlighter Palette adds a serious glow to your cheekbones. Featuring three pearlescent powders in duo-chrome shades and one creamy 'melted strobe' hue, Huda’s latest creation allows you to build custom radiance that complements all skin tones. The unique blend of light-reflecting pearls and super-soft formula makes for effortless blending, whether you wear each shade individually or layered for a holographic effect. Winter Rose is a light-medium pink which has warm, coppery undertones and slight pink-to-coral shifting shimmer. As this is my first Huda product, I wasn't too sure what to expect, but this is an incredible palette! If I have managed to convince you just how amazing this Glossybox Advent Calendar is, then you can join the waiting list right here. It is available now to subscribers but to those of you who are not a Glossybox subscriber then set your clocks for 7pm on Monday 15th October because that is when this beauty launches and it will cost just £99 but has a value of over £300! That's amazing! I can't believe how many full sized products you get and that highlighter palette is insane!